[!] there are twelve known species of bats that call South Dakota home. Some of these bats migrate to warmer climates for the winter and some remain year long. Some bats hibernate in caves and abandoned mines. [!] that all species of bats in South Dakota are insectivorous. They can eat their weight in insects each evening. [!] that bats are the only mammals capable of true flight. 'Flying' squirrels do not really fly, rather, they glide from tree to tree. [!] that bats hibernate? The spend late fall fattening themselves up for a very long winter nap that may last until late spring when their favorite food has also reappeared - bugs! [!] that bats are very vulnerable to disturbance during hibernation. Please do not disturb bats, especially during the winter. It's a matter of life and death for them since they cannot afford to expend the energy needed for arousal. [!] that if you find bats in you attic you do not need to kill them. There are ways to exclude bats that allow the bats to find other roosts. 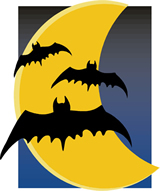 Follow this link to learn more about SAFE 'Bat Exclusion' from our homes. Myths and stereotypes - Most things that people "know" about bats are not true. They are not flying mice, nor are they blind, nor will they attack humans. They are warm-blooded, furry, and nurse their young with milk. Bats are critical components in a balanced ecosystem. They are unmatched predators of night-flying insects (many are human pests). In turn, bats are important prey for owls in some parts of the United States thereby providing an important link in the food-web. Whole ecosystems may depend on their existence, e.g., the Lesser Long-nosed bat is the sole pollinator of Saguaro cacti that in turn provide food and shelter for many other species. In rainforests, bats are responsible for 95% of the seed dispersal that is critical for reforestation. Besides pollination, seed dispersal, and pest control, bats have other benefits. Bat guano provides fertilizer, chemicals, and jobs in many parts of the world. Even Vampire bats have contributed to medicine through studies of anti-coagulants in their saliva that aid in the treatment of circulatory disorders. Bats are endangered-In spite of all the benefits of bats, they are endangered. 40% of all bat species in the U.S. are Endangered. When one hears of the 20 million free-tailed bats living in Bracken Cave in Central Texas, it is difficult to imagine them at risk. Yet, one colony of 30 million bats in Arizona was reduced by 99% in just 6 years. While bats are at risk for many reasons, it is the loss of habitat and vandalism that most affects bat populations in the United States. Bats Around the World-Over 900 species of bat make up one quarter of all mammalian species. Bats are found everywhere on the planet except for the polar regions. The smallest bat is Kitti's hog-nosed bat that is the size of a jelly bean and weighs less than a penny. The largest bats are often called Flying Foxes and can weigh up to two pounds and have a wing span of five feet. Around the world, bats can be carnivorous, (fish, frogs, lizards, birds, small mammals), frugivorous (fruit), nectarivorous (nectar, pollen), and even sanguinivorous (blood), but most bats are insectivorous (insects). South Dakota's Bats-All of South Dakota's bats are small, and eat bugs. They feed upon moths, beetles, and other night flying insects, consuming up to half their body weight in insects each night. In desert regions, Pallid bats will drop to the ground and eat scorpions. Though our bats have small eyes, they utilize echolocation (biological sonar). Using high-pitched sounds and listening for the echoes inaudible to human ears, bats navigate through the night sky and locate their insect prey. Their ability to 'hear' their environment is so precise that they can detect objects as thin as human hair - that is, they do not get tangled in people's hair.Indeed! The study of bat echolocation has helped develop some extraordinary navigational aids for the Blind. Handwings-Chiroptera, the scientific Order of bats, means 'hand-wing'. Their extremely long arms and fingers are very much like our own, only covered and webbed by an thin, double layer of skin that also attaches down at their ankles. Their elastic wing membranes help collapse the hand-wing (much like an umbrella) when the wing is not needed. Their legs are engineered for hanging upside down and are rotated so that the knees point out to the sides of their body. Bats in the South Dakota are quite small, no bigger than a man's thumb, but may appear larger when they are flying because their wings are extended (8-12 inches). Unlike birds, bats fly using large muscles in their backs and chests much like a swimmer doing the butterfly stroke. They can steer and brake by intricate manipulation of their fingers within their wings. Reproduction-Bats mate in the fall prior to hibernation or migration. Sperm is stored by the female until spring when ovulation and fertilization occur. Typically, bats have only one pup each year though multiple births may occur. The pups are born live, without hair, and with their eyes closed. At three weeks, they are ready to be weaned and learn how to fly and forage. While mortality is very high during their first year (2/3 may die), Little Brown bats are known to live as long as thirty years. Habitats and Hibernation-Not all bats find caves the ideal habitat. Many live in mines, the undersides of bridges, hollow trees, under loose tree bark, and foliage. As natural habitat is destroyed, several species take taken to roosting in the eaves and attics of buildings. In our neighborhoods, Big Brown, and Little Brown bats are the most likely to be your mysterious, and harmless renters. A positive affect of humans on bat populations is the addition of street-lights that tend to concentrate insects, namely moths. It is important not to disturb bats when they are roosting or hibernating. Hibernation is a state of reduced metabolic rate, during which a bats' breathing and heart-rate decrease significantly. During the winter, one disturbance could force the bat to burn 10-30 days of body fat, without enough body fat to last the winter, they die. Health concerns-Like all mammals (i.e., cats, dogs, humans), bats are susceptible to a wide range of health problems including rabies, a viral disease that causes progressive paralysis and death. Contrary to folk-belief, the incidence of rabies in bats is very low - less than 1/2 of 1% of wild bats exhibit the disease. Nevertheless, people should avoid handling bats; Like most wild animals, bats become frightened when handled and even the healthiest bats will bite in self-defense. Interaction with ANY wild animal that would allow saliva to contact a wound/mucous membrane should be followed up with a call to your physician and the nearest county health department.